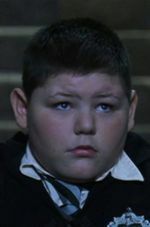 Crabbe is large, has gorilla-like arms, and wears a pudding bowl-style haircut. He is very mean and very stupid, which makes him little more than a "follower" of Malfoy. His father, Crabbe Sr., is a Death Eater. A custom tag is a generic placeholder to record additional information specific to your document. This page is within a frameset. View the entire genealogy report of Crabbe families, or surname index of Crabbe pedigrees or report summary Crabbe heritage from 'Harry Potter Family Tree'.